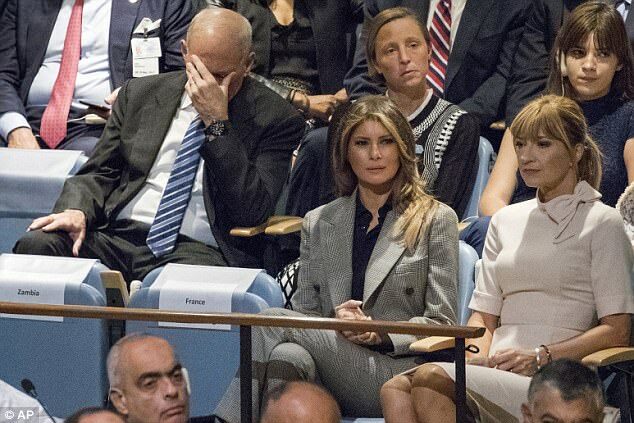 The photos of John Kelly’s exasperated reaction to President Donald Trump‘s speech to the UN today exploded on Twitter Tuesday. 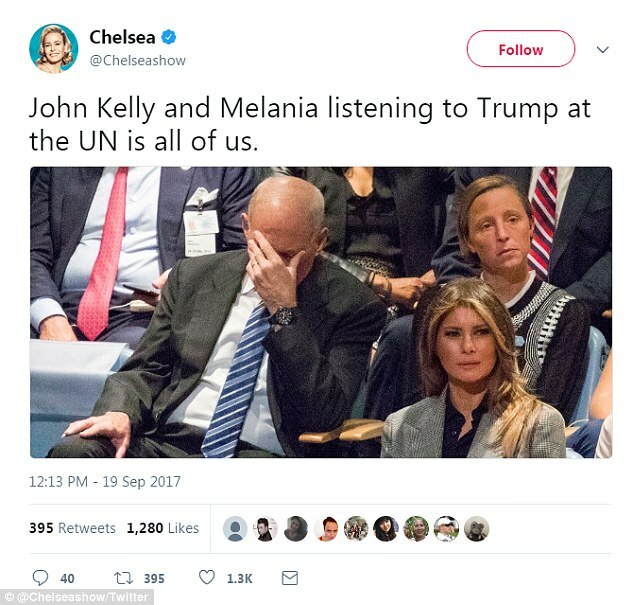 The usually stoic White House Chief of Staff put his hand over his face as the president addressed the 193-nation body. In addition to labeling Kim Jong-un ‘Rocket Man’ for threatening to used nukes, the commander in chief blasted ‘loser terrorists,’ the ‘corrupt’ government in Venezuela, and the ‘murderous’ Iranian regime, and ‘rogue regimes’. 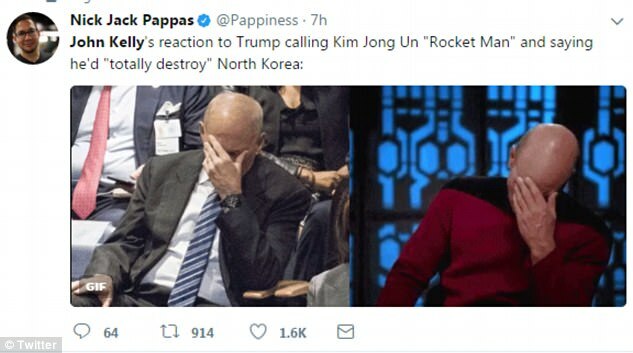 Kelly couldn’t control his reaction and cupped his temple with his hand, similar to a Star Trek meme as several pointed out on social media. At another point, he put his elbows on his knees and pressed his face onto his clasped hands, looking like he was deeply contemplating his choices. It isn’t clear what the 67-year-old thought of the speech, but his facial cues indicated he was less than pleased. His reaction was similar to how he looked when Trump first said there were bad guys on ‘both sides’ of the Charlottesville riots, grouping together Neo-Nazis and protesters. He replaced the former chief of staff Reince Priebus in July. White House Press Secretary Sarah Huckabee Sanders was questioned about the speech and Kelly’s response on Fox and Friends Wednesday morning. Sanders laughed off the chief of staff’s embarrassed demeanor – claiming that he was probably just tired. 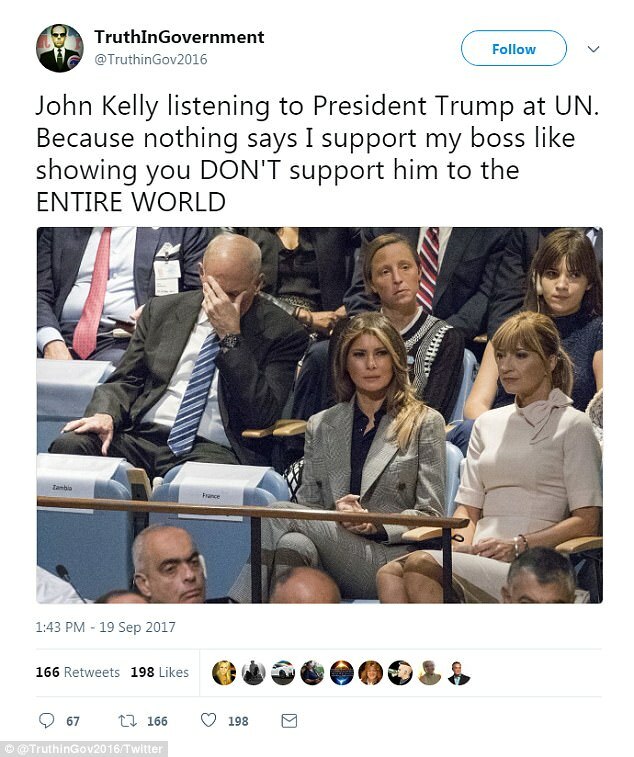 She claimed that Kelly wasn’t reacting to the speech itself, and that, in fact, he was part fo the speech writig process. ‘I would certainly not read anything into that picture,’ Sanders explained.